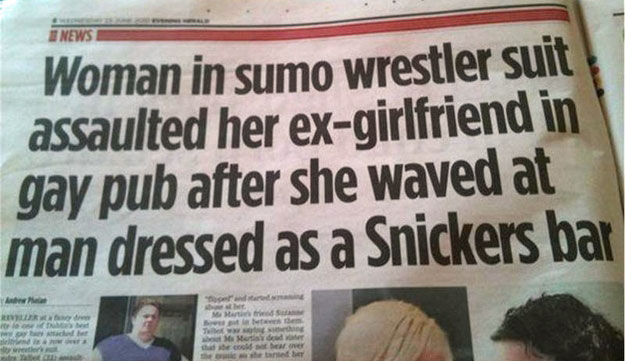 The summer silly season is already in full swing, and with less people buying newspapers during the school holidays and football season break, news editors and reporters are desperate to get us all to buy their daily fodder by featuring some of the silliest and WTF news stories around. Share your favourites here (they can be from any year), and include a link if possible. @LZA, we both live in CT. May I ask what part? Have you been watching the Aaron Hernandez mess?? They are now screening a lake in his hometown of Bristol to see if they can find the gun. He was from CT (where I and LZA live). I was going to post a local CT news link, but realized I may be posting to people all over the world. WHY WHY WHY would anyone with such god given talent throw it all away? It looks like he's guilty as hell, but I'll say it's still alleged to be fair. (08-11-2013, 10:48 PM)P3LL Wrote: WHY WHY WHY would anyone with such god given talent throw it all away? It looks like he's guilty as hell, but I'll say it's still alleged to be fair. WHY WHY WHY would anyone mix Italian, Puerto Rican and Irish blood lines? It's a crime waiting to happen. Err...ah MAN! Maybe during all the "MIXING" of the bloodlines they were able to get rid of the gun?